Work Order Plus introduced several new tables to the Elliott system. Most of these can be maintained under [BOMP Main Menu à Maintenance]. While not all are required to make WO+ work, some are essential. Labor Grade defines the estimated hourly rate for a labor level. Work Center represents one machine, multiple similar machines or a work place and contains most of the burden information for this work center. Department can group multiple work centers or operators for analysis or management. Operation ID can maintain similar operations for different item routings or order routings. Product Structure defines the basic bill of material of a parent item and Production Routing defines the routing to manufacture it. Special Operation defines all indirect labor codes not related to production, like machine maintenance or meetings. Operator and Shift provide detail information of an operator. An operator can use an ID to clock in and clock out, as well as report for production. Only Labor Grade and Work Center are required by WO+. Most of the optional tables can assist you in many ways, therefore you should evaluate your needs and set them up accordingly. To avoid conflicts and backtracking, we recommend setting up these tables in the following sequence: Labor Gradeà Departmentà Work Centerà Operation IDà Production Routingà Product Structureà Shift IDà Operator IDà Special Operation. Labor Grade is used to estimate the hourly rate of a level of labor. The system will use this rate to calculate labor cost for each work order. Labor Grade for a labor level. Description of the Labor Grade. 13 numeric digits with 6 decimal places and an optional minus sign. Current labor rate of the labor grade. This rate should be a little higher than the average salary of this level if labor insurance, benefits, etc. are part of the labor cost. The basic rule of thumb is to use 10% more than the average salary. 13 numeric digits with 6 decimal places and an optional minus sign. Display only. This is the rate prior to the current rate. A standard date format and an Elliott User ID. Display only. This is the date this labor grade was changed and the Elliott User who changed it. There are 2 BOMP Global Setup fields requiring a Labor Grade for a default value. Remember to set them after creating new labor grades. A Department can be a building or floor in the company, a group of work centers, or a group of operators or workers. The Department ID field can be found in both the Work Center file and the Operator file, which acts as a group ID. So, you can have “Department of the Work Center” and “Department of Operator”. They can share the same ID or have different ones. A Department can be an analysis, evaluation and management unit for a group of work centers or a group of operators. Managers can monitor the status of work centers in a department. An operator can report labor for a department with multiple work centers. The labor of this operator will be automatically distributed to all the work centers. Department managers can have special rights to handle exceptions happening in the department. The Department provides default values when adding a new work center. All the fields in this table are similar to those in the Work Center file, except for Department ID (4 alpha-numeric characters) and Description (30 alpha-numeric characters), so the detail of each field will be described in the Work Centersection. This means the Department can provide default values when adding a Work Center. Departments can be based on your company’s physical departments, but you are not required to do so. You may already have departments in the Shop Floor Module and can use the entries there to create departments in BOMP. The department tables for these two modules are separate and serve only their respective module. All operations using the same ID can be updated when any value is changed in the Operation ID file. To enable this feature, set field 48, Mass Change Routing thru Oper ID Maint, to “Y” or “A” in BOMP Global Setup. Export production routings to a spreadsheet and sort it by Operation ID. In addition to the maintenance benefit, the Operation ID can speed up the process to create a new routing. The Operation ID record contains every field in the Operation file and these fields serve as default values. These values will be loaded when an operator creates a new operation or changes an operation ID for one operation. Plus, the Operation ID can be useful when the routing needs to be changed during the production. For example, products may be configured to have an outside process where they are sent to a local store for painting, but the production is changed and the operator needs to paint it in the shop. Rather than modifying the routing through the order entry interface, the operator can change the current operation from one Operation ID to another and all the values will be replaced with the current operation. Operation ID can be used as an evaluation and analysis unit. The 12 Month Report can be used to analyze the scrap percentage and the cost of pieces processed over past year for each operation ID. Operation ID was only a text field in Macola’s Standard Product Routing Module. Work Order Plus makes this field more powerful by creating a table for the ID, which makes it more useful and meaningful as a management and analysis tool. Although the Operation ID is optional, we recommend utilizing this table. Most of the fields are the same as those in Product Routing and will be discussed in that section. Substitute Operation ID (field 15) – When production plans change, the operator can change the operation ID of the current operation to its substitute. The substitute Operation ID may or may not be similar. Production Routing describes how each parent item is manufactured, step by step. Each manufactured item can have multiple routings and one can be the default routing. Each routing has one or more operations (or steps) and each operation can represent one step in the manufacturing process. In the figure above, production of DRIVE-SHAFT takes 6 steps: Material Preparation, Assembly, Welding, Balancing, Outside Processing for painting, and Packaging. Each step defines one operation in the routing file. Under the Production Routing Maintenance menu, three functions can be found, Maintenance, List and Import. The Maintenance function will bring up the maintenance screen shown above. The List function will print out selected routings and can be used to export routings to a CSV file. The Import function imports operations from a CSV file. Enter an Item Number and Routing Number in the Maintenance screen and the system will list all the operations for this routing. 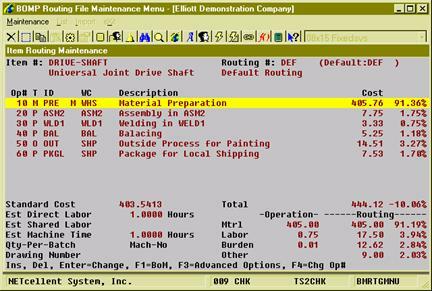 The cost information will appear to the right of each operation and below that displays a summary of cost information. Display of the cost information is subject to several security flags. They may need to be turned on for managers and turned off for others. To create a routing, simply enter a new routing number. A routing can be copied from another manufactured item if it shares the same routing structure. The system will provide this option through the F5 key if the current routing is empty. Press the F3 Key to remove the routing. Use the F2 Key to change Routing Header Description. The Insert Key can be used to add an operation. The Delete Key can be used to remove an operation. Press the Enter Key to change the operation detail. Use the F4 Key to change the operation number. Press the F1 Key to view material in each operation. This is based on the BOMP Global Setup. If this routing is not the default routing of the item, the user can set it through the F5 Key. Figure 18 shows the detail information of an operation when an operator is adding or changing it. Most of the fields are the same as those in Operation ID. 4 numeric digits 1 through 8999. Operation Number of one production step. This should be a number from 1 to 8999. Workers in the production department should work on routing operations in sequence by the operation number. This should be a valid Operation ID or blank. If the Operation ID is given in add mode, the rest of the fields default to values in that Operation ID. In change mode, the system will ask the operator if the new Operation ID should override the rest of the fields with values from that ID. S - Setup or Miscellaneous Operation. For machine setup or to gather miscellaneous labor. This type of operation can be skipped if it is not a material issue point. O - Outside Process. This type of operation has outside process information like vendor number and FOB cost. Defaults to “P” or the value in the Operation ID file. Two fields of 30 alpha-numeric characters. Each operation can have 2 description lines. The work center is where this operation takes place. Production burden cost will be calculated based on the burden parameters in this work center. Default direct labor grade of this operation. This will be used as a standard for evaluation variance. Also, if an operator creates a production transaction through Production Transaction Processing, this will be used to calculate labor cost by default. Defaults to the value in the work center file. Default shared labor grade of this operation. This will be used as a standard for evaluation variance. Also, if an operator creates a production transaction through Production Transaction Processing, this will be used to calculate labor cost by default. Number of pieces which will be processed in one batch. For example, if this is 10 (qty per batch), then it will place 15 pieces into 2 batches. If each batch takes 2 hours, the system would estimate it needs 4 hours to process 15 pieces. 0 - no batch or 1 piece per batch. Whether all values for this operation are estimated or standard value. If they are standard values, a variance between standard value and actual value may exist and will be presented on various screens and reports. Otherwise, the variance is not applicable by default. In “Hr/Qty” or “Hr/Batch” measurement, 10 numeric digits with 4 decimal places and an optional minus sign. In “Qty/Hr” or “Batch/Hr” measurement, 10 numeric digits with 3 decimal places and an optional minus sign. In “Fixed Hrs” measurement, 12 numeric digits with 6 decimal places and an optional minus sign. The number of direct labor hours to process each piece or batch. The measurement can be Hours per Qty/Batch, Qty/Batch per Hours or a fixed hour. This value will be used for performance evaluation. F1­ - toggle to Hours per Qty/Batch. F2­ - toggle to Qty/Batch per Hour. F3­ - toggle to Fixed Hours. The number of shared labor hours to process each piece or batch. The measurement can be Hours per Qty/Batch, Qty/Batch per Hours or a fixed hour. This value will be used for performance evaluation. The number of machine hours to process each piece or batch. The measurement can be Hours per Qty/Batch, Qty/Batch per Hours or a fixed hour. This value will be used for performance evaluation. The mode in which the machine is running for this operation. “R” - Run Mode. 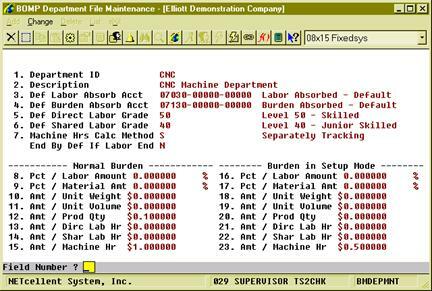 If the machine is in run mode, the system will use Normal Burden in the work center to calculate burden. “S” - Setup Mode. 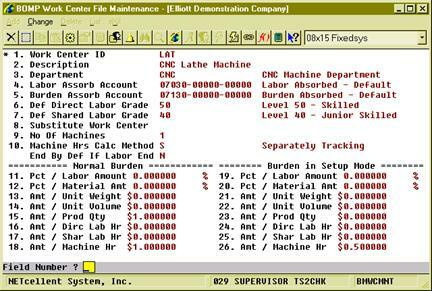 The system will use Burden in Setup Mode in the work center to calculate burden. Machine number used for this operation. There is no limitation on the text. User Defined Code for this operation. The literal for this field is defined in BOMP Global Setup. In figure 17, it is set to “Drawing Number”. Whether the operator needs to enter a comment when starting the operation. If operation type is “O” for outside process, the operator needs to enter extra outside process related fields including Purchase Order Number, Purchase Order Line, Vendor Number and cost information. If the Purchase Order package is on, the standard PO format will be used. If the POpackage is off, 10 alpha-numeric characters. The Purchase Order number of the outside process. This can be blank. If the PO package is on, this should be an existing PO. It can be a Blanket PO. Purchase Order Line Item number of this outside process. This field is available if thePO number is given. If the PO package is on, the item number for this line item should not exist in the Item file. The Vendor number of this outside process. This field is available to change if the PO number is not given or the PO package is off. Otherwise, it should be the same as that in the purchase order. Free On Board or Freight On Board cost per piece for the outside process. This is a standard value for the operation. If the operator entered an existing PO, the system may override this value with that in the PO Line Item with the appropriate BOMP Global Setup. Extra cost per piece for outside process, like tax or extra burden. The system always uses the value defined in the operation to calculate the outside process cost. 9 numeric digits with 2 decimal places and an optional minus sign. Fixed cost per transaction for an outside process. The cost is the same no matter how many pieces are sent for an outside process. Work Order Plus provides a feature to update all uncompleted work orders when a value in a Production Routing is changed. This can be turned on by changing field 49, Mass Change Routing thru Product Routing Mnt, in BOMP Global Setup to “Y” or “A”. When values are changed in an operation the system will ask if the operator wants to update all orders. In addition to maintaining production routings one by one, operators can export all routings to a CSV file, edit the export file and import them back into the system. If you have routings in the Standard Product Routing module, Elliott provides a tool to export all routings to a WO+ compatible CSV file (Main Menu à Manufacturing à Standard Product Routing à Processing à Routing Entry à Export). You can import them through Routing Import in BOMP. Standard Product Routing allowed a pointer to be created in an operation that pointed to a general routing. Since BOMP does not support pointers, the export process will create an operation entry for each operation in the general routing when a pointer is encountered. Also, the system will not export any Tool or Note entries. Bill of Materials is a list of all the components needed to produce a parent item and the quantity required. The system will deduct the quantity of components in the production based on the bill of material. 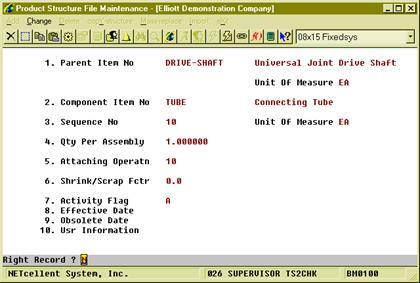 The Product Structure file defines the basic Bill of Materials for a manufactured item. 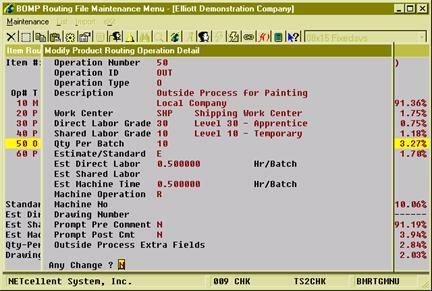 Operators can modify the structure for plus work orders and report different components during the production. For more detail of each field, refer to the Bill Of Materials Manual. One field has been added for WO+. Attach To Operatn – Indicates in which step of the routing this component is consumed. If the component is usually issued in a fixed operation number, entering that number can be beneficial. 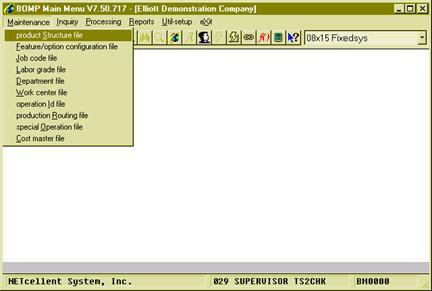 This field is related to BOMP Global Setup field 16, Def Copy Comp to Which Oper for Plus WO. If this flag is set to “A”, for Attach To Operation, the system will assume the component will be consumed in the operation indicated. If this field is left blank, the system will assume this component will be consumed in the first operation of the routing. There can be only one set of bill of materials for each parent item in this file. If the parent item has multiple combinations of components, there are several solutions. Change the components for each work order. Make it a Feature Item. Create Base Orders (you can find more information in the Base Order section). If the company has more than one shift, ex. overnight shift, and labor in this shift has a different rate, you will need to create Shift records. You can define a normal starting and ending shift time, break time and a meal break time. Also, you can define a premium rate for this shift. Enter a description for this shift. 2 numeric digits of hour and 2 numeric digits of minute for both starting and ending time. Enter the starting and ending times for this shift. The total work time for this shift. 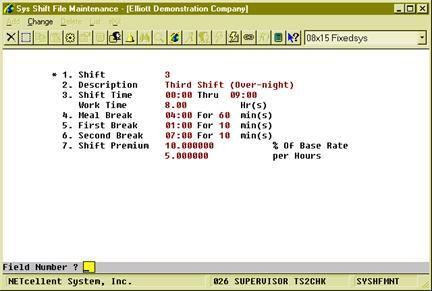 This is display-only and automatically calculated based on shift time and meal break time. 2 numeric digits for the hour and 2 numeric digits for the minute of the starting time. 3 numeric digits for the number of minutes. Enter starting time of the meal break and the length in minutes. The hour must be a number from 0 to 23. Meal break is non-paid. Enter starting time of the first payable break and the length in minutes. The hour must be a number from 0 to 23. Enter starting time of the second payable break and the length in minutes. The hour must be a number from 0 to 23. Percentage to change the base labor rate to obtain the premium rate. Amount per hour to change the base labor rate to obtain the premium rate. This is in addition to the rate obtained by the percentage above. Based on the example in Figure 19, an operator with a base labor rate of $10 per hour would calculate the premium rate by (10 * (100 + 10)/100) + 5 to give you $16. The Shift ID field can be found in the Operator file. If an operator changes shift from one to another, you can simply change the Shift ID in the Operator file and the system will load all the related information.